Users now have a research tool to help quickly solve problems that are otherwise very time consuming to resolve. The documentation that A5Doc produces is automatically stored in a searchable table. This can be searched for anything, such as which scripts use a certain variable or field name, or which tables contain a field name of "account", for example. 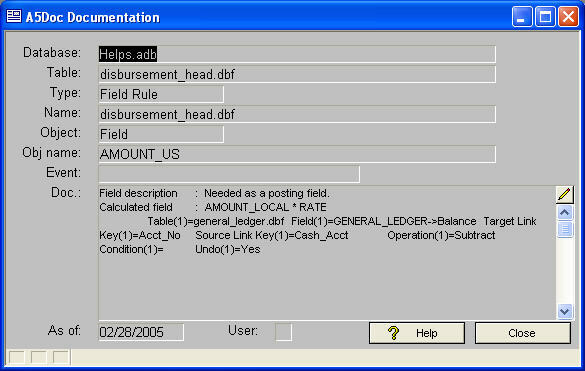 The help file describes samples of how this capability can be used. There are more samples of advanced usage in the Usage Techniques section of this site. 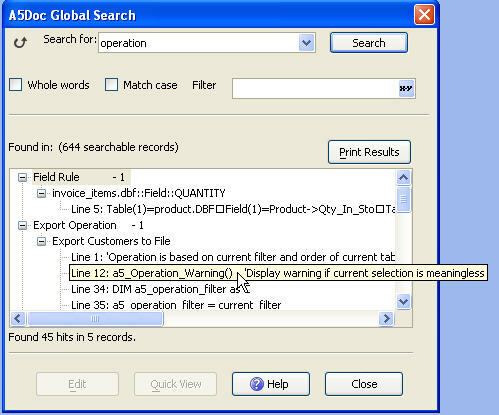 The two tools available are the Research/Documentation form and the Global Search dialog. 1. Global Search is the easiest way to search the results of your documentation run. The Edit button immediately opens the appropriate Alpha Five editor for direct editing of objects. The Print button produces a report of the expanded search results. 2. The Documentation form provides all the traditional query capabilities of a standard Alpha Five form. Selected pages of documentation can also be reprinted from this form.